This edition was printed by Nicolaus Hasselbach, who learned his trade from Christopher Saur. 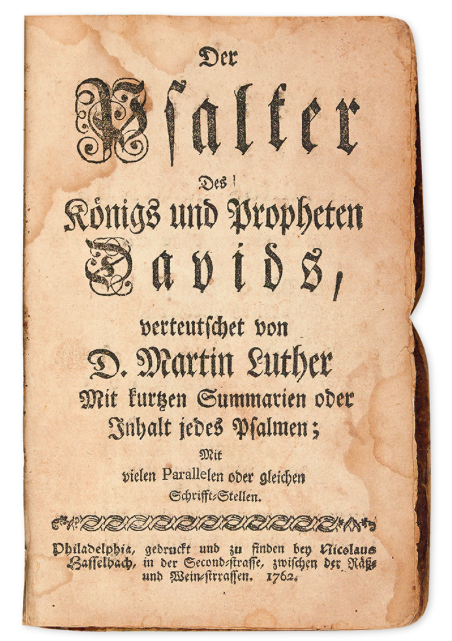 Saur, a Pietist, was the first to print with the German-Fraktur typeface in North America. He was competition for Benjamin Franklin, who had a monopoly on the the German-language print market until Sauer got a press and type from radical pietists in Germany. He is known for printing the first German-language Bible in America. Hasselbach started his business in Philadelphia, where he was part-owner of a print shop in Chestnut Hill and an investor in a paper mill in Germantown. He moved to Baltimore in 1765, a few years after printing this psalter. He set up in business for himself and was Baltimore's first printer in any language. Hasselbach printed a number of almanacs and possibly some religious tracts, including one called Zwey wahrhafte von gantz besondrn Himmels-Zichen (Two true, very special Heaven-Signs), an apocalyptic text which has been attributed to him on typographical evidence. Hasselbach died only four or five years after getting started in Baltimore. On a business trip back to Europe, he was died at sea. His widow sold the printing shop to William Goddard, a New Englander, who used it to print Baltimore's first newspaper in 1773, The Maryland Journal. The book of psalms sold at a New York auction last week. It brought $938.